The recipe for the original Coronation Chicken couldn’t be easier, requiring just 10 minutes to make and a few simple ingredients, and it all comes together in a couple of simple easy-to-follow steps. The original Coronation chicken was invented by writer Constance Spry and the founder of the famous Le Cordon Bleu cookery school Rosemary Hume, while preparing the food for the banquet of the coronation of Queen Elizabeth II in 1953. The original dish is basically cooked chicken meat with a simple curried mayonnaise dressing, and it’s quite funny that such a simple recipe made its way into Buckingham Palace. You might find it surprising, but the original recipe calls for curry powder, because fresh curry spices were almost impossible to find in post-war Britain. Nowadays you can easily find Coronation Chicken everywhere in UK, from supermarkets, deli shops to sandwich bars. 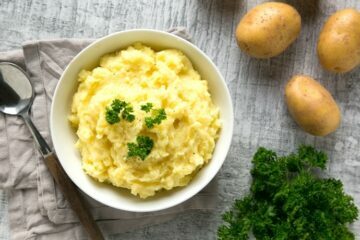 Unfortunately, over the years this recipe has lost a bit of its charm, with so many ingredients and variations added, it looks now a really vague reinterpretation of the royal dish. 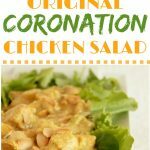 Most Coronation Chicken versions out there include ingredients that have nothing to do with the original version, such as sultanas. 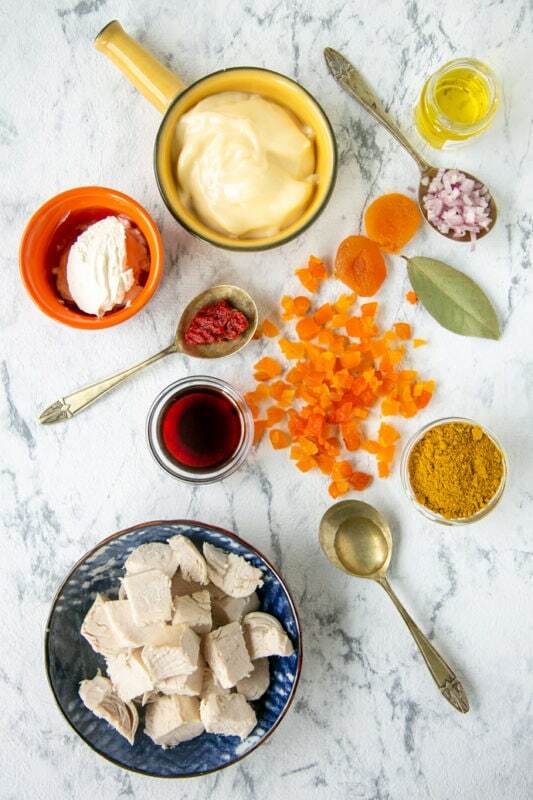 The original Coronation Chicken recipe doesn’t contain a single sultana, only dried apricots (that can be chopped or pureed), and the dressing includes a balanced mix of mayonnaise and whipped cream. The Coronation Chicken recipe I’m sharing today follows very precisely the original recipe, and it couldn’t be easier to make. All you need is just a few simple ingredients: cooked chicken, dried apricots, mayonnaise, crème fraîche, olive oil, curry powder, white onion (or shallot), red wine, bay leaf, lemon juice, a pinch of sugar and of course, salt & pepper. The only minor change I made to the original recipe it’s swapping the whipped cream with light crème fraîche for a lighter result. But you can totally follow the traditional route if you want, and use fresh unsweetened whipped cream. And if you want to lighten things up a little bit more, swap the cream with Greek yogurt. The dressing for your Coronation Chicken comes together in as little as 7-8 minutes. Once you have stir-fried the onion with the bay leaf and curry powder, add in the lemon juice, tomato puree, red wine and water, and cook for a couple of minutes, then strain and cool. Transfer the prepared mixture in a bowl, add chopped dried apricots, mayonnaise ( I use homemade mayo whenever possible) and whipped cream (or crème fraiche/yogurt), and mix everything together. Now, all you have to is add in the chicken and mix everything gently together. Et-voilà! Your Coronation Chicken is all ready. How To Cook The Chicken For Coronation Chicken? For the cooked chicken meat, you can simply grill or steam the skinless chicken breasts (you can also use skinless and boneless chicken thighs if you like). I usually poach the chicken in water with a peeled carrot, onion, potato, celery stalk and a bay leave. This way I can save up all the chicken stock and use it for other tasty recipes. The original Coronation Chicken recipe instructs to poach the chicken in a big pot of water with a carrot, a bay leaf, a splash of wine, a little fresh thyme and parsley, and four peppercorns. Use your preferred method from the two above mentioned, and poach the chicken for 40 minutes, then cool it down, chop into chunks and mix it with the prepared coronation chicken dressing. There are endless ways to serve your Coronation Chicken! Here are a few of my favorite ways: in a sandwich, on top of lettuce leaves, with basmati rice, a salad, grilled veggies or as a topping for a baked potato. This Coronation Chicken in an airtight container and keep it in the fridge for up to two days. I don’t recommend storing it in the freezer. How Can I Make Coronation Chicken Allergy-friendly? 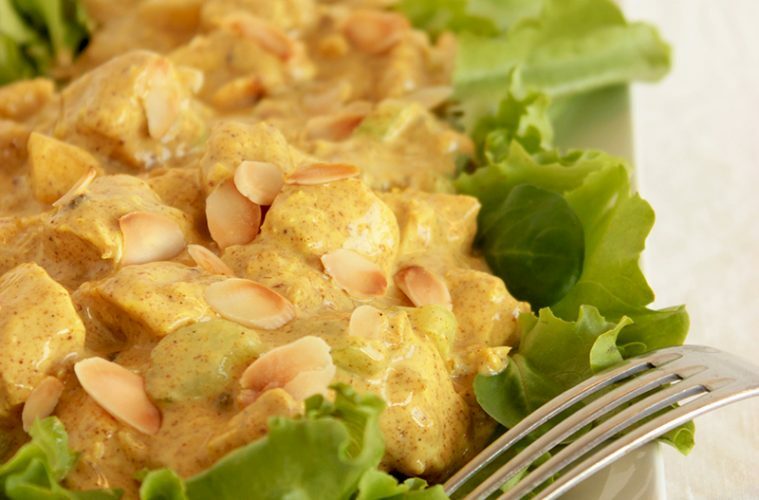 The original Coronation Chicken is naturally gluten-free, soy-free, peanut-free and nuts-free. To make it egg-free use a suitable store-bought mayonnaise, and to make it dairy-free I recommend swapping the crème fraiche with a thick dairy-free yogurt (try coconut yogurt). 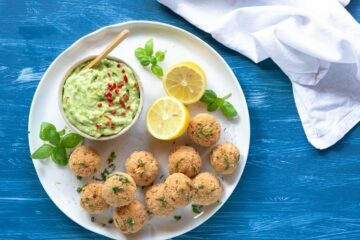 I can’t believe that this wonderful dish takes only 10 minutes to make! Such a good classic, and perfect filler for sandwiches too! I love that you went back to the original. Not that there’s anything wrong with an adaptation, but I think it’s fun to enjoy a dish in it’s original form. I love that something like this was part of the royal coronation! My husband loves chicken so I am always looking for new recipe. This one looks delicious – love the name too! Definitely pinning this recipe for later! Oh my goodness. 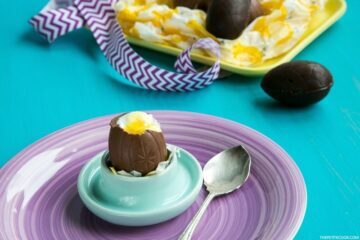 It looks SO good and it is SO easy to make! I’ve never had coronation chicken! I’m thinking I’ve got to try it – soon! So creamy! Never heard this of recipe. But few of my friends likes chicken dish, i will pass on to them. I can’t believe I have never heard of coronation chicken. 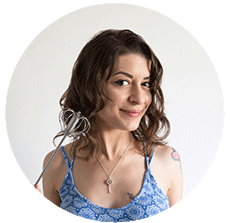 All of the ingredients sound like an incredible combination, one I am super excited to try! This is such a moreish dish! Thanks for sharing this classic. I wonder what will be the next coronation dish? Oh how unique and delicious looking! I’ve never heard of this dish but wow it sounds amazing! Loving the addition of dried apricots! Can’t wait to make this! I think I’ll swap the cream with Greek Yogurt since that’s what I have in my fridge all the time. Thanks for sharing Andrea! That sounds like an awesome idea 🙂 I suggest you add a little yogurt at a time and taste the mix out as you add it, so you can balance out the tartness coming from the yogurt! I made it yesterday, it was tasty!!! Thank you so much for sharing! I’ve added celery and toasted almonds and it was really really good, I can’t wait to make it again. Just made this and it tasted incredible, my family loved it too! I’ve never come across the measurement of a glass before (1/2 glass in this recipe). Can you put that in ounces or millilitres? Thanks so much. Hi Liz, sorry about that! It’s typical italian to put some measures in glass, and I forgot this is not often the case elsewhere 🙂 I’ve now updated the recipe, hope you enjoy this delicious Coronation chicken salad! Thanks so much. 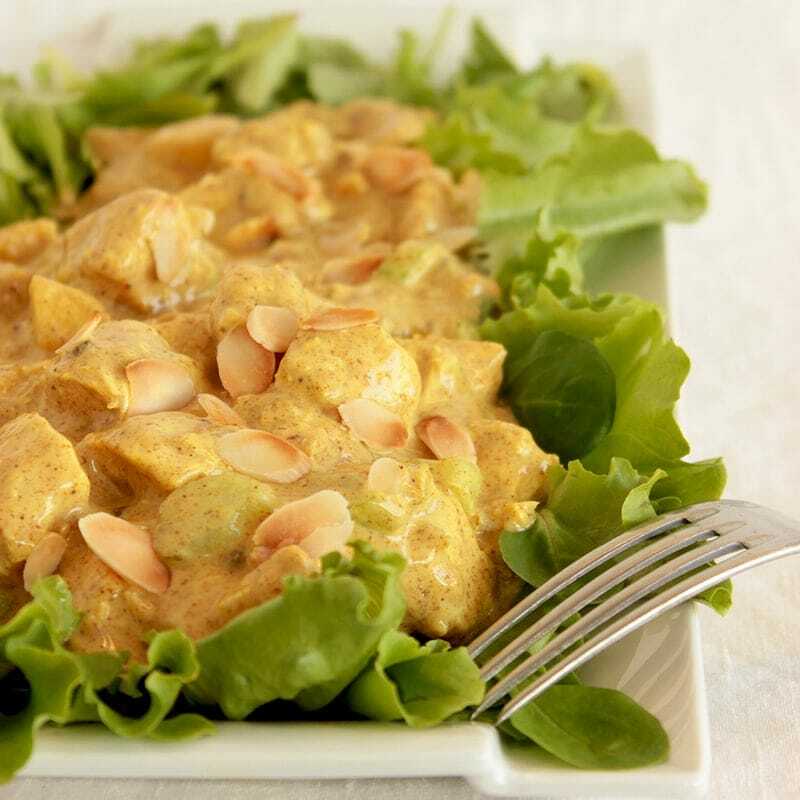 I’ve been looking for a good coronation chicken recipe for some time and this one looks great.